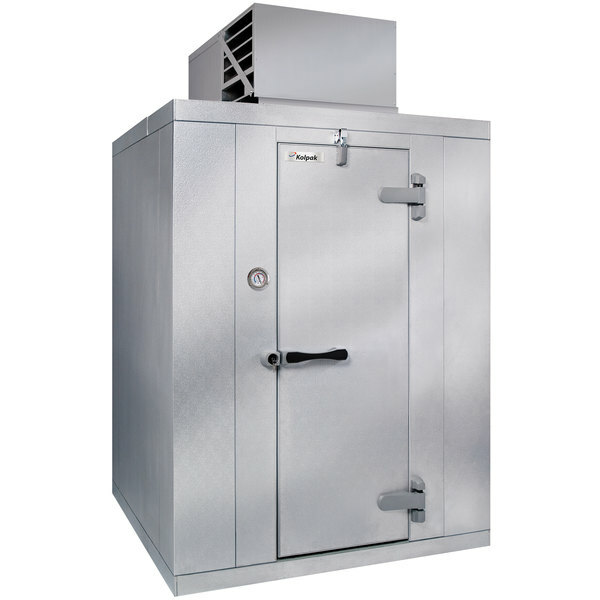 Keep bulk quantities of your refrigerated goods chilled to food safe temperatures with this Kolpak QSX6-086-CT Polar Pak walk-in cooler! The self-contained 1/2 hp refrigeration system is mounted flush to the ceiling so that you can use 100% of your unit's interior for maximum space-saving efficiency. The system is extremely simple to install and features an automatic condensate evaporator to eliminate the need for a drain line and other plumbing, saving you money on the services of a plumber or refrigeration technician. It uses R-404A refrigerant to maintain a temperature of 38 degrees Fahrenheit. The 26 gauge stucco embossed galvalume steel panels snap together with ease and boast Posi-Loc fasteners to provide you with a perfect airtight fit. Inside the panels is 4" thick CFC-free urethane insulation that not only helps the cooler operate efficiently and maintain consistent temperatures, but also helps give it exceptional structural integrity! The floorless design comes with vinyl screeds for an easy installation and tight seal that allows you to install this model on a ground-contact concrete floor. This provides you with enhanced structural support over similar units with aluminum floors, making it great for situations where heavy shelving or fully-loaded carts will be used.